Nearly half of all UK consumers with a tablet or smartphone (46%) now use mobile devices as their primary tool for telecoms purchase decision making, 39% for insurance and 33% for retail, according to new research from location ad platform xAd and call measurement technology provider Telmetrics. 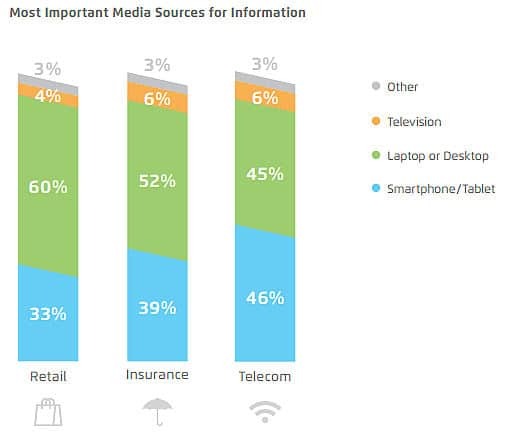 Some 33% only use a mobile phone for retail shopping research, 13% for insurance and 10% for telecoms, the survey also found, while 26% of smartphone owners also used a tablet for shopping research and 21% of tablet owners also used a smartphone. Most mobile activity happens at the beginning of the consumer’s purchasing process, the second annual ‘UK Mobile Path-to-Purchase Study’ found, with less than 20% of respondents saying they know exactly what they are looking for when they first turn to their mobile device — leaving 80% of consumers open to influence by marketers.